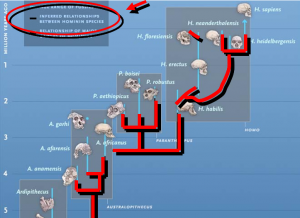 Why are the (expected) countless millions of transitional fossils missing? Charles Darwin noted the problem and it still remains more than 2 centuries later. The evolutionary family trees in textbooks are based on PURE imagination, not fossil evidence, or any other evidence for that matter. The late famous Harvard paleontologist (and fervent Darwinist), Stephen Jay Gould, wrote, “The extreme rarity of transitional forms in the fossil record persists as the trade secret of paleontology”. The fact is that the average Darwinist cladogram has as much in common with factual scientific evidence and observation as the Santa cladogram pictured here. 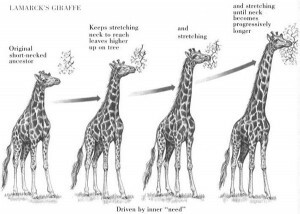 Note that there are actual examples of living things with lines connecting them to “inferred” and utterly imaginary things. In modern “evolutionary” biology, there is an assumption of imaginary living things that span the gaps and “link” all of the gaping chasms in the fossil record and in observed biological processes. While there should be hundreds of thousands of transitional forms that “transition” every single living thing on the planet from the mythical “simple” single celled “original” ancestor into current complex multi-cellular living things, the fact is that there simply aren’t more than a few very questionable examples. 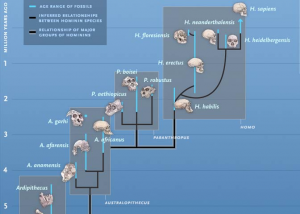 In the human fossil record, there is an assumption of monkey to man transformation. 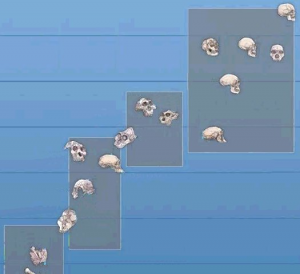 However, an objective study reveals only a collection of monkey bones (fully ape) an man bones (fully human). Other Darwinist fossil experts also acknowledge the problem at an intellectual level, though like Gould, they completely ignore it at a philosophical level. Charles Darwin famously predicted that “future discoveries” in the fossil record would validate his theory. In more than 2 centuries, the actual fossil record has done nothing more than disprove his theory again and again. For more information about question number 9 in this searies, visit creation.com/pattquote. The truth is that a rational human being without a philosphical bias has to conclude that the evidence does not support the assumption. In fact, it contradicts it. The more consistent answer to this very large question is that we were designed by an intelligent agent and we bear the tool marks of that design effort.